To raise employee awareness of opportunities to save energy and contribute to a healthy work environment, form a green team at work. While debate exists about recycling and other aspects of environmentalism, a green team is motivational for employees who want to make a difference in their work environment. Your millennial employees are especially anxious to make a difference in the world environment. A green team at work fits the bill. The green team may even save energy and time, keep trash out of landfills, opt for reusable dishes, share books in a library, and more for your work environment. A team is a great way to brainstorm and develop ideas. Like any other team, a green team is an opportunity to involve your employees and to let your employees learn to work together effectively, develop leadership and team skills, and make a difference in a cause that is near and dear to many employees' hearts. A green team sounds like a win for everyone. Limit the use of space heaters. Ask employees to dress more warmly instead. Space heaters can also become hazardous especially if employees forget to turn them off. Buy and sell used two-way radios, parts, and equipment at locations such as UsedRadios.com. 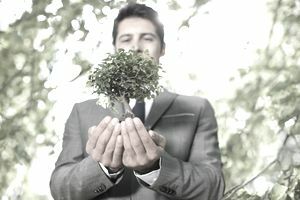 Your green team at work is a win for the employer, the employees, and the world environment that sustains us all. Use these ideas to help your green team get started. Your team is a welcome addition to your empowering, engaging work environment for employees. Don't let an opportunity so simple, yet so demonstrative of corporate social responsibility, pass you by. Form a green team at work.